Little Brown & Co. Used - Good. Former Library book. Shows some signs of wear, and may have some markings on the inside. Little Brown & Co. Used - Very Good. Great condition for a used book! Minimal wear. Little Brown & Co. Used - Good. Shows some signs of wear, and may have some markings on the inside. 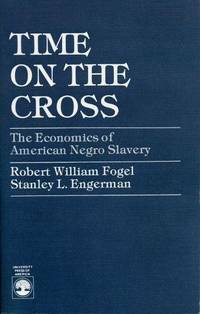 Fogel, Robert William; Engerman, Stanley L.
Little Brown & Co. Hardcover. 0316286990 Good Condition. Five star seller - Buy with confidence! . Good. 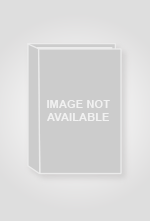 University Press Of America. Paperback. GOOD. Spine creases, wear to binding and pages from reading. May contain limited notes, underlining or highlighting that does affect the text. Possible ex library copy, thatâll have the markings and stickers associated from the library. Accessories such as CD, codes, toys, may not be included. Blue Ridge Summit, Pennsylvania, U.S.A.: Univ Pr of Amer, 1984. As new condition except for fading spine. Grey paperback with red print on front cover and spine. Top right corner of ffep there is a price and date penciled in. 286pps. No DJ.. Trade Paperback. Fine/No Jacket. 8vo - over 7¾" - 9¾" tall. W. W. Norton & Co., 1974. Book. Very Good. Soft cover. 12 Mo. 306 pp., clean text, remainder - black, blue, white - office. New York: W. W. Norton & Company, 1989. Softcover. Very Good with No dust jacket as issued. Sound binding. Clean, tanned pages. Wrappers have light shelf wear. 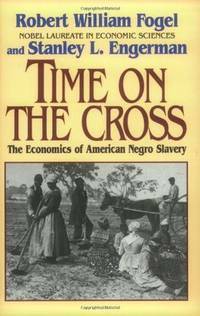 Classic cliometric study of African-American slavery. 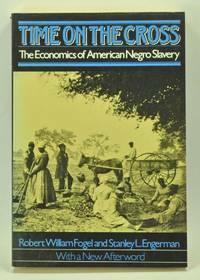 Reprint of the original text (1974), unchanged except for minor corrections and a new afterword in which the authors assess their earlier work, drawing on their own research since 1974 as well as on the work of numerous other scholars. ; 7.75" tall; 324 pages. Norton & Company, Incorporated, W. W., 1995. Paperback. Good. Disclaimer:A copy that has been read, but remains in clean condition. All pages are intact, and the cover is intact. The spine may show signs of wear. Pages can include limited notes and highlighting, and the copy can include previous owner inscriptions. At ThriftBooks, our motto is: Read More, Spend Less.Dust jacket quality is not guaranteed. University Press Of America, 1986-03-03. Paperback. Good. W. W. Norton & Company. Paperback. 0393312186 Light wear. Cover corner creased. . Good. 2013-01-23. Reissue. 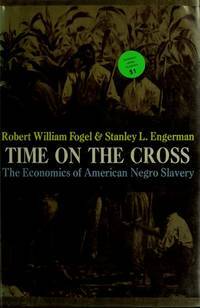 FOGEL, Robert William, and ENGERMAN, Stanley L.
New York: W.W. Norton & Company, 1989. Paperback. Small 8vo. Stiff glazed pictorial wrappers. xviii, 306pp. Tables, numerous figures. Near fine. First of this Norton edition, pristine and handsome, of an influential title first published in 1974 (Boston: Little Brown & Company). Little Brown & Co (T), 1974-04. Hardcover. Good. Boston, MA: Little, Brown, 1974. Ex-Library. Good. Soft cover. 8vo - over 7¾" - 9¾" tall. 286pp. 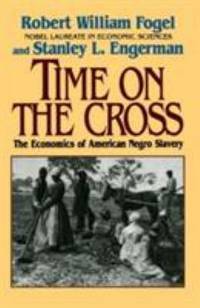 A critical evaluation of the economics of slavery in America. Illustrated with charts and maps. Dr. Fogel won a Nobel Prize for this work. Ex-library, with card pocket, spine label, and library markings. Good. Little Brown & Co, 1974-04-01. Hardcover. Good/No DJ. 8vo; Picture may not match book; ex-library markings include stamps/labels/card pocket; no DJ, if one issued; light wear/scuffing to boards/spine; head/tail/corners lightly bumped/creased; spine/edges lightly sunned/faded; light browning to page edges and free pages; text unmarked and clean. Orders will be mailed either on the day ordered or the next business day. Expedited shipping available. Boston: Little Brown, 1974. Library markings; light wear to corners and head and tail of spine; 267p, bibliog.. First Edition. Hard Cover. Good/No Jacket. 8vo - over 7¾" - 9¾" tall. Ex-Academic Library. W. W. Norton & Company, 1995-08-17. Paperback. Good. W. W. Norton & Company. PAPERBACK. 0393312186 *LIKE NEW* Ships Same Day or Next! . Fine.